ICF Chennai Recruitment 2017 2018 for 10 Football, Kabaddi, Basketball, Hockey, Volleyball, Tennis Posts Download Application Form. ICF Chennai Sports Quota Jobs Notification 2017 Released. 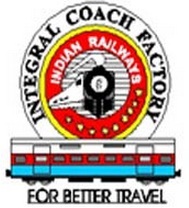 ICF Chennai invites Off-line applications for appointment in following Sports Quota post in Integral Coach Factory, Chennai. Candidates are requested to Download Application through Official website www.icf.indianrailways.gov.in. The last date for submission of applications is 12.10.2017. Prospective candidates will have to apply before carefully reading the advertisement regarding the process of examinations and interview, eligibility criteria, Offline registration processes, payment of prescribed application fee/intimation charges, ICF Chennai pattern of examination, ICF Chennai Syllabus, ICF Chennai Question Paper, ICF Chennai Admit Date Release Date, ICF Chennai Exam Date, ICF Chennai Result Date etc. and ensure that they fulfil the stipulated criteria before Applying. 2. Junior Clerk or Technician Gr.III - 12th (+2 stage) or its equivalent examination with not less than 50% marks in the aggregate. Mere pass would suffice in case of SC/ST/Ex-servicemen. and Those persons selected as Junior Clerk are required to acquire proficiency in Typewriting of 30 WPM in English or 25 WPM in Hindi within a period of TWO years from the date of appointment and their appointment will be provisional subject to acquiring the prescribed typing qualification within the stipulated period. (or) ITI/Act Apprenticeship in relevant engineering trades. A. Sports persons must possess the minimum educational qualification as applicable to the post. B. Those selected as Senior Clerk / Junior Clerk are required to possess proficiency in Typewriting of 30 WPM in English or 25 WPM in Hindi within a period of FOUR years from the date of appointment.